Urthboy performs ‘Long Loud Hours’ with Bertie Blackman. 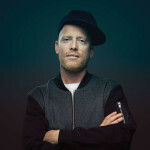 Urthboy (Tim Levinson) is an award-winning Hip Hop artist from Sydney, who just dropped his fifth studio album ‘The Past Beasts Inside Me Like A Second Heartbeat”. Urthboy’s first solo album Distant Sense of Random Menace was released in 2004, but it was 2007’s The Signal that kicked things up a notch. The first single ‘We Get Around’ cracked the top 25 in triple j’s Hottest 100 and it received two AIR Award nomination, a j Award nomina­tion, and was shortlisted for the Australian Music Prize (AMP). After a break and the birth of his daughter, Urthboy released ‘Long Loud Hours’ (featuring Bertie Blackman) his first official single in 3 years. Finally, on March 4, 2016 Urthboy released his new album The Past Beats Inside Me Like A Second Heartbeat.